Here is one of my favorite family recipes. It is so easy and uses only a few easy ingredients. First, season pork chops with salt and pepper. Then use 2 Tbsp of Olive Oil (or Butter) to cook the pork chops in a frying pan. I usually do 4-6 minutes on each side until the Pork Chops are cooked thoroughly. While Pork Chops are cooking, prepare the Pork Stuffing according to the directions on the box. This is super easy. After the Pork Chops are cooked all the way, cut them into strips or bite size pieces. Next, Layer it up! 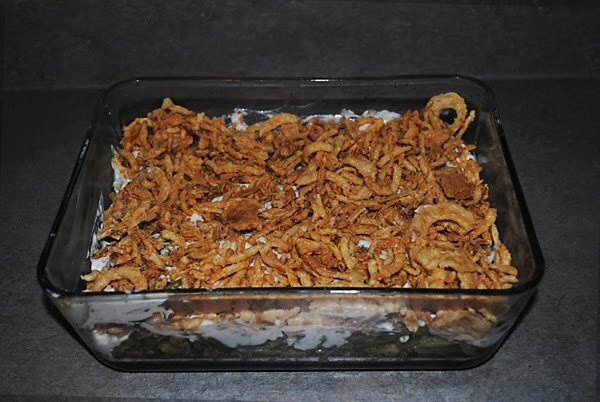 Add all of the ingredients in a casserole dish. You can do this in any order but this is how I like to do it. Starting at the bottom, I put in the Stuffing then Cream of Mushroom soup then cut up Pork Chops, then Green beans and Fried Onions on top. This recipe can easily be doubled (or even tripled) for a bigger family! Let me know if you try this out and if you liked it! Enjoy! I made this for dinner tonight and it was absolutely delicious! thank you for the recipe, will make again and again! I can acquire knowledge in this artilce. Thank you.